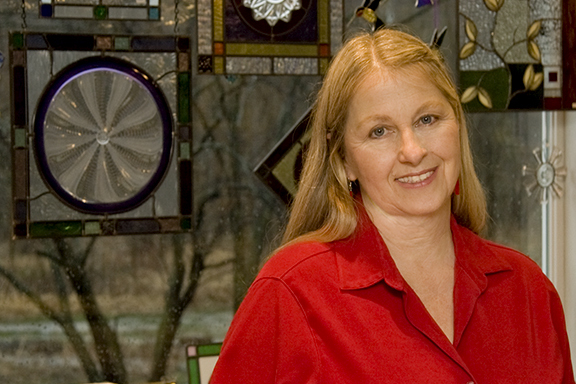 Linda Sutterer has been working with glass for over 30 years. A juried member of The Best of Missouri Hands. Thirty two years of working with stained glass is still a joy. I like to experiment with fusing techniques, lampworking and try new designs to keep things fresh. Many of my custom ordered designs feature painted elements. As a third generation artist, drawing and painting started very early in life. My grandfather and mother were my first mentors. For many years studio and business experience came from Mithra Glassworks of St. Louis, MO. Incorporating antique glass plates (most from the 1930s depression era) into panels for hanging has been my signature item for the past 12 years. Currently a pile of old architectural glass tiles and blown rondels are waiting to become useful again. I strive to be near perfect in craftsmanship. Often soldering skills and manipulating the metal came neatly and correctly is an often overlooked process. I'm so gratified when people comment and notice the quality. New inspirations are always forth coming with the support of my husband, Joe and son, Jacob.